Picture of doughnuts since DCA was a supplier of doughnut mixes. This picture is of DCA fruit pie filling. Below is a photo of Beddington's (Maidstone) factory where processed fruit is produced. DCA acquired Beddington Fruit Ltd in 1990. Beddington was a high volume producer of processed fruit especially prepared for yogurt. Its equipment was flexible and fully automated. Supervisor Harry Palmer is seen in the foreground. DCA (Doughnut Corporation of America) was bought by Lyons during the American 'company buying spree' of 1972 (Tetley Tea) and 1973 (Baskin Robbins Ice Cream). On 28 September 1972 they bought 60% of the issued share capital of DCA and therefore had management control. However, this operation was not fully integrated with the Lyons business and operated quite independently until its eventual disposal. 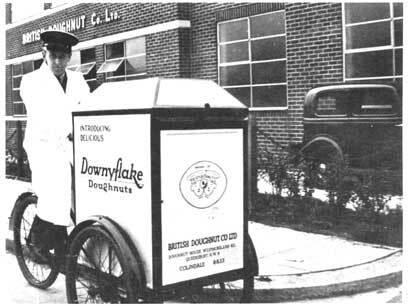 Doughnut Corporation of America was started in 1920 - some histories give the date as 1937 - to sell automatic doughnut-making machines to bakeries. The machines operated in bakery windows from which people bought hot, freshly made doughnuts. These original machines made 480 doughnuts an hour. By the 1980s the machines were capable of 2,000 doughnuts per hour. The company soon realised that it would have to make prepared mixes for bakers so they could produce doughnuts of a uniform standard. This led to the preparation of other mixes for the baking trade. Inevitably they were soon producing other food processing products such as breading and batter mixes for seafood and poultry and fruit fillings. DCA was headed by # M. Levitt (whose father founded the company) from 1949 until 1980. Its headquarters were in New York City with a mix plant and flour mill in Hillsdale, Michigan, a bread & batter plant in Millstadt, Illinois, and an equipment factory in Jessup, Maryland. There were other smaller factories and in total some 1,500 people worked for the company. DCA established a subsidiary in the UK under the name of the British Doughnut Company. It made American type ring doughnuts and distributed them by tricycle to catering outlets in the area around their premises in Clapham Road, South London. They were known as Downyflake Doughnuts. It also imported doughnut making machines from the US which were sold to bakers and caterers together with doughnut mixes which were blended in the Clapham Road factory. During the war the company was fully stretched servicing the Red Cross, Women's Voluntary Service and the Salvation Army, all of whom were ministering to the needs of servicemen in the UK and on the continent. The arrival of US servicemen in great numbers increased the demand for doughnuts. After the war business was difficult but the company was resilient enough to build back its fortunes and in time it became necessary to move to larger premises in Queensbury in north-west London where the numbers of mixes continued to increase in number and volume. In 1955 the name of the company was changed to DCA Industries Ltd. Further expansion was required in 1962 and the company set up its head office and manufacturing base in Aylesbury, Warrington. When Lyons acquired their equity in the parent company in 1972 it included the UK subsidiary. In 1978 DCA Food Industries Inc. acquired the assets of G. L. Baking Company and Price-Wilhoite Company, both US based. Progressively Lyons acquired more of the issued share capital of DCA Food Industries Inc. so that by 1978 it owned more than 80% of the company. DCA diversified their operation in the UK and formed a Frozen Food Division making frozen onion rings, potato fritters, bubble & squeak, breaded prawns and battered apple rings to the catering trade. Their frozen food factory was situated at Sutton Bridge, Lincolnshire, but it was destroyed by fire on 30 March 1982 and rebuilt. This company made American style ring doughnuts and distributed them to catering outlets in the area around their premises in Clapham Road, South London. Their distribution system included the use of tricycles as this picture show.